Web of Science: Why are coffee stains darkest at the edges when they dry? Why are coffee stains darkest at the edges when they dry? There are many things around us that are so taken for granted that it never occurs to us to give them a second thought until we look a little closer. Coffee stains are one such thing. When coffee dries it leaves stains that are dark at the edges and lighter inside. The explanation may not be obvious but it is in fact rather simple. 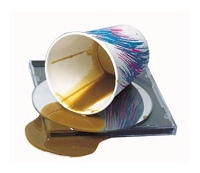 When a drop lands on a table, it spreads and tries to dampen as large an area as possible. Though the table surface may seem smooth there are always some imperfections where the edges of the drop will stop. This can be compared to deep ruts in a track from which it is difficult to steer a vehicle's wheels. In the same way the movement of the edges of the drop is hindered and it needs energy to diminish its circumference on the table. Near the edge of the drop the upper surface slopes at an angle to the table surface. So the area of the drop's upper surface is greater than the area of its lower surface. Evaporation is in proportion to the drop's upper surface. So the evaporation per unit of area of the table surface is greatest at the edge of the drop. The circumference and the edges of the drop remain unchanged as liquid in the drop evaporates. Because the evaporation is faster at the edges, liquid has to flow there. When all the liquid has evaporated, proportionately more has evaporated from the edges of the area that it covered on the table. There is a strong colour agent in coffee that is carried by the flow of liquid and remains when the liquid has evaporated. So the colour agent is in higher concentrations at the edges of the drop than in the middle. The same happens if we have a clear drop of water. As it has no colour agent we cannot see the process with our bare eyes. It is best to understand this by looking at a cross-section of a coffee stain on a kitchen table. Image 1 shows a cross section of a new drop of coffee. Image 2 shows a cross-section of the same drop of coffee a little later, where it can be seen that it dries quickest at the edges. As it keeps the same shape, liquid is drawn to the edges of the drop and carries solid dark particles (coffee) with it. The final stage is shown in image 3 which is an exaggerated cross-section of the dark layer that remains when all the liquid has evaporated. So the explanation in a nutshell is that more of the liquid carrying coffee particles, evaporates at the edges than in the centre. So more solids are deposited at the edges which means that the dark material is thicker there and darker than other parts of the stain. Halldór Svavarsson. „Why are coffee stains darkest at the edges when they dry?“. The Icelandic Web of Science 27.12.2005. http://why.is/svar.php?id=5513. (Skoðað 21.4.2019).